Bicycle builder Orville Wright lifts off the beach at Kitty Hawk, North Carolina, for a twelve-second flight, traveling 120 feet. 10:35 a.m.  December 17, 1903 In 1892, Wilbur and Orville Wright bought new "safety" bicycles and soon cycling became a shared passion. They joined a local bicycle club, the YMCA Wheelmen, went on long country rides, and did a little racing. And because their scratch-built printing presses had made their reputations as mechanics, they were beset upon by friends in need of bicycle repair. Soon the Wrights had a good repair business. They opened a shop in early 1893, the Wright Cycle Exchange. In addition to repairing bicycles, they also sold new bikes and accessories. 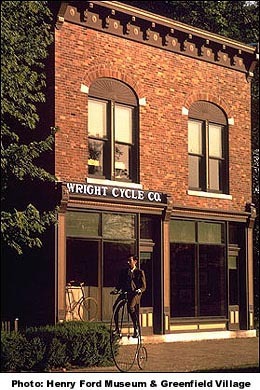 Business was brisk, and in late 1893 they moved to larger quarters and renamed the business the Wright Cycle Company. From 1892 to 1916 their bicycle shop had six different locations. It was during this time, starting in 1896, that the Wright brothers began to consider seriously the possibility of human flight. In less than a year, bicycles were their primary business. After several years of repairing bicycles, the Wright brothers decided they could build a better bike than they could buy. In 1896, the began to manufacture the top-of-the line Van Cleve and the lower-priced St. Clair, both named for Ohio pioneers. These were not mass-produced machines, but were hand-built to a customer�s specifications. At that time, the bicycle industry was analogous to computers today. Small-time manufacturers could build their own brands from readily available components. The Wrights added a few original improvements, including an oil-retaining wheel hub and coaster brakes. By 1898, they were earning $2,000 to $3,000 a year in profits from the bicycle business, a respectable income for the times. With Orville Wright as pilot, the airplane took off from a launching rail and flew for 12 seconds and a distance of 37 meters (120 feet). The airplane was flown three more times that day, with the brothers alternating as pilot. The longest flight, with Wilbur at the controls, was 260 meters (852 feet) and lasted 59 seconds. The Wright 1903 Flyer is on display in the in Milestones of Flight gallery at the Smithsonian National Air and Space Museum in Washington, D.C.
On October 5, 1905, Wilbur made a spectacular, 39 minute flight that covered 24.5 miles over a closed course with the brothers' third airplane at Huffman Prairie, Ohio. The plane and a replica of their Dayton bicycle shop are on display at Carillon Historical Park in Dayton, Ohio. Wilbur and Orville took more than 300 glass-plate photographs, including images of their early experiments with gliders and powered flyers. Today 303 of these negatives are still in existence. The executors of Orville Wright's estate donated these negatives to the Library of Congress which for some governmental reason has not digitized the images. Instead, Photographs by the Wright Brothers have been made available by the Psychology Department at the University of Hawaii as a chapter in To Fly is Everything . . . , Gary Bradshaw's virtual museum dedicated to the invention of the airplane. The Wright Brothers Aeroplane Company & Museum of Pioneer Aviation offers a wealth of information and links from Ohio. The Henry Ford Museum & Greenfield Village acquired the Wright Brothers' Cycle Shop and their family home in 1936. They were moved from Dayton, Ohio to Dearborn, Michigan, west of Detroit, rebuilt and renovated, and are open to the public in a remarkable theme park that celebrates the American inventions and industry of Ford, Thomas Edison, the Wright Brothers and Buckminster Fuller. It was in this building that Orville and Wilbur Wright crafted their bicycles and built all the components for their first experimental gliders and airplanes, paving the way for their first flight. The Wright brothers' historic wind tunnel experiments, which led to the advanced design of their Flyer's wings, took place in the back room of this bicycle shop. The museum has an extensive bicycle collection and presents parades, demonstrations and riding opportunities throughout the year. 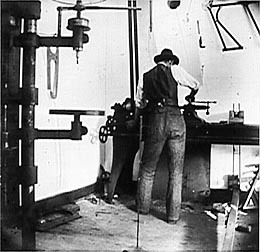 Wilbur Wright in the Dayton shop, 1897. On June 12, 1979, the Gossamer Albatross, an aircraft propelled by a person pedaling, won the largest prize in aviation, the Kremer �100,000 Competition. Under the leadership of Paul D. MacCready, Jr., it was flown 22.5 miles across the English Channel. The Michelob Light Eagle and Daedalus human powered aircraft were testbeds for flight research conducted at the NASA Dryden Flight Research Center, Edwards, California between January 1987 and March 1988. The most impressive flight achieved to date is that of the Daedalus project. On April 3, 1988, the Daedalus 88, a human powered airplane, flew 115.11 km (71.53 miles) from Heraklion, Crete, to the island of Santorini. See 19th Century Bicycle News for a selected bibliography and historical resources online, or use the links to find other sites of interest.